I made you guys some Paleo Cookie Dough Truffles! Since we are about to start a kitchen renovation, we are trying to eat mostly from what we have in the pantry. I happened to have some macadamia nuts, so I made macadamia nut butter. It’s super easy and can be made in under 5 minutes. 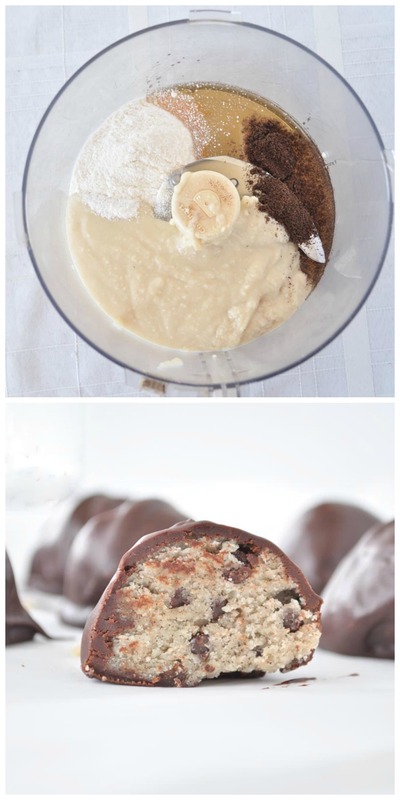 I then wanted to create a recipe that used it so that is how these Paleo Cookie Dough Truffles came out. You all know how I love healthy truffle recipes! 🙂 This recipe is so easy and only calls for 6 ingredients! I love the little flecks of vanilla bean in these! It also adds great flavor. If you like this, then you may also like my strawberry creme truffles or my pumpkin truffles. Not only are these paleo cookie dough truffles easy, they are also gluten free and vegan. Keep them in the fridge or freezer when you want a little something sweet. This recipe makes a small batch too. Feel free to double it if you like. 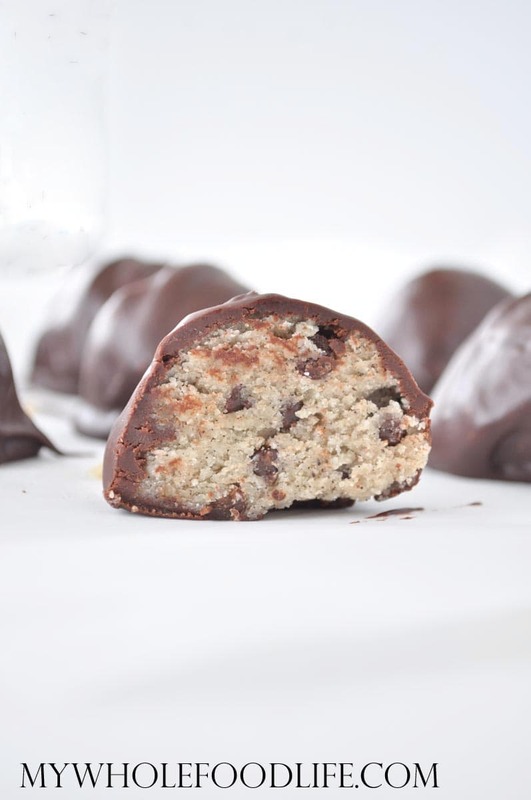 All you need is 6 simple ingredients to make these cookie dough truffles! In a food processor , combine the macadamia butter, vanilla beans, maple syrup and coconut flour. Mix well. Throw in about 1/4 cup mini chocolate chips and pulse a few times to mix them in. Place the food processor bowl in the fridge for 15 minutes. Using a cookie scoop , drop cookies onto a parchment lined baking sheet . Once all the cookies are on the sheet, place it in the freezer while you make the chocolate. Using a double boiler method, melt the chocolate chips and the almond milk. Once the chocolate is smooth, roll each cookie dough ball into the chocolate and place onto the parchment lined baking sheet. Using two forks works great for this. Place the finished truffles back in the freezer to firm up. Once the chocolate is firm, you can store the truffles in the fridge or freezer. Where can I find ground vanilla beans? If I but regular ones do I just toss them into a food processor? I get them on Amazon http://tinyurl.com/ouk5kob You can also buy a vanilla bean and scrape out the seeds. Are you able to supplement anything for the Vanilla bean? Would Vanilla extract be ok? Yes, but keep in mind you will taste the alcohol since this is not cooked. You can also buy a vanilla bean and scrape out the seeds. Haha! I hope you enjoy them! I didn't think nuts were ok on paleo? Nuts are fine on paleo. Just not peanuts. Yummie! These look and sound delicious! These look so yummy! Do you suppose (mostly because i am lazy) that these would be good and hold together as a ball without the chocolate coating? Either way i think i need to try macadamia butter asap! Thanks! Can I make my own macadamia butter? If so, will 2 cups nuts make 1 cup of macadamia butter? Do you think it would still turn out okay if I halfed the recipe? I only have about a cup of nuts! I can't have coconut or almonds, is there another type of flour that I could substitute? Thanks! Would it be possible to make them nut-free and use Sunflower Seed butter? About how many truffles does the recipe make? I want to make these this weekend for a lake party and I want to make sure I have enough! :) Thanks! Hi Emily! I used a medium cookie scoop and it made 12. If you use a small cookie scoop, it should make about 20 bite sized truffles.